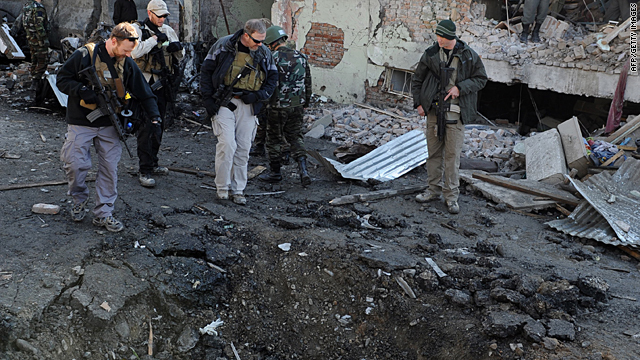 Foreign investigators inspect a crater left by the blast on Tuesday December 15 in Kabul. Kabul, Afghanistan (CNN) -- An explosion outside the home of Afghanistan's former vice president killed at least eight people Tuesday, government officials have said. The explosion was near the Kabul residence of former vice-president Ahmad Zia Massoud, Afghan President Hamid Karzai told reporters. Massoud was not harmed in the attack. Among those killed were one of Massoud's guards and an assistant, the former vice president's aide said. Forty others were wounded in the blast. The explosion broke windows in a hotel a few blocks away. Tuesday morning's explosion occurred as the Afghan president was at a nearby anti-corruption convention. Karzai issued a statement condemning the attack, calling it inhumane and cowardly. The president called for a full scale investigation. Massoud is a notable figure in Afghan politics. Not only was he a vice president of the county under Karzai, but his brother the late Ahmed Shah Massoud was heralded as a leader in the fight against the Taliban. Ahmed Shah Massoud, the leader of the Northern Alliance, the Taliban's main opposition, was killed September 9, 2001, by a bomb inside a video camera during an interview at his headquarters with Tunisian al Qaeda operatives posing as journalists. Meanwhile the International Committee of the Red Cross visited three Afghan security forces being held captive by the Taliban for the first time, the agency said Tuesday. The two visits occurred in late November in Badghis province in northwestern Afghanistan, the agency said. "This is the first time since the beginning of the current conflict that the ICRC has visited people detained by the armed opposition," said Reto Stocker, head of the ICRC's delegation in Kabul. "We plan to conduct and repeat visits in other regions, and hope to visit people held by other armed opposition groups, with the aim of ensuring that everyone detained in relation to the armed conflict is treated humanely." The ICRC says it regularly visits detained people in conflict zones to assess their conditions and treatment. The agency say it currently currently visits 136 places of detention in Afghanistan.